I was first Sergt at the time. We moved up in front of the enemies line about noon of the day in question. We hurriedly threw up breastworks, had orders late in afternoon to strengthen the works that night. 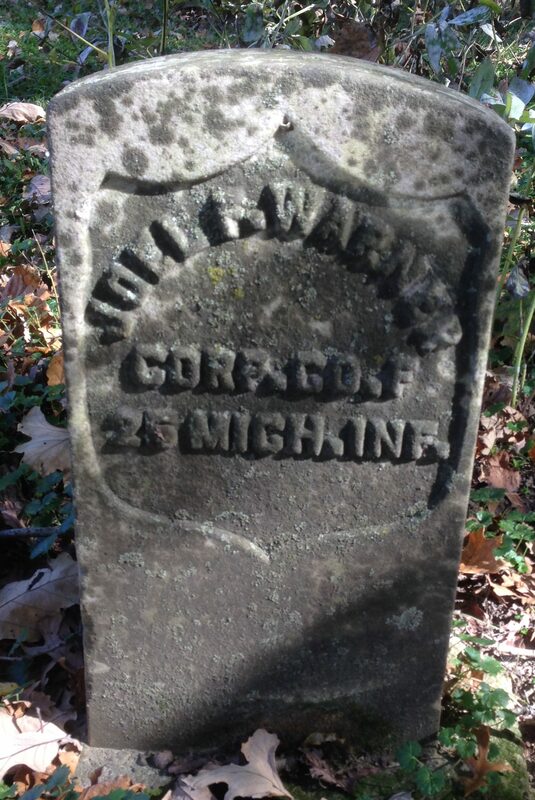 I made a detail from my Co, J. F. Warner being one of the number & set them to work.I then went to the rear some 10 or 15 rods & lay down for the night, The weather was warm and our line in the woods. We put up no tents. The night was very dark. Some of the men went in front of the works to dig a trench, J. F. Warner with their number. Through some mistake or neglect a gun with fixed bayonet was left leaning against the works. Some time in the night the enemy opened fire on our line with artillery. It lasted but a few minutes, did not alarm the camp to much extent. But the men in front of the works came back very hurriedly. J. F. Warner came in contact with said bayonet, which struck him somewhere in the region of the groin, and carried clear over on the point of it to the ground. He seized hold of the bayonet with both hands and being a man of superior strength kept it from going through him, twisting the shank of the bayonet around the barrel of the gun. I did not see the wound, he was immediately moved to Hospital before I was apprised of the fact. I saw the condition of the bayonet. He returned to duty September 16. He had two other short spells in the hospital, in October for fever and in November for neuralgia. He was mustered out with the company on June 24, 1865 at Salisbury, North Carolina. Following his discharge he returned to Three Oaks, Michigan, where he remained until 1872, when he moved to Oswego, Illinois, and then to Dayton. In 1876, Joel Warner applied for an invalid pension since his ability to work was hampered by the effects of his old injury. He was examined by a local doctor, who estimated that he was 50 percent disabled because of a scrotal hernia on the left side. He had also suffered the loss of his right leg four inches below the knee in a railroad accident, although this happened many years after his war service. His request for a pension was initially refused, on the grounds that he was not truly incapacitated. However, in 1890 another pension law was passed, expanding the grounds for acceptance. He reapplied, and this time received a pension of $12/month, which was later raised to $20/month. Warner died in Dayton September 26, 1911, and was buried in the Dayton Cemetery. His widow received a pension of $12/month following her husband’s death, and in 1916 that was increased to $20/month. Mary Ann (Inman) Warner died January 20, 1918, at the age of 79, and is also buried in the Dayton Cemetery.